Bovine tracheal smooth muscle myosin. 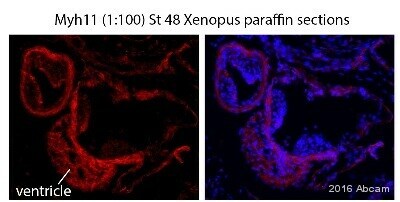 Antisera to smooth muscle myosin 11 were raised by repeated immunisations of rabbits with highly purified antigen. Purified IgG was prepared by ion exchange chromatography. Our Abpromise guarantee covers the use of ab53219 in the following tested applications. WB Use at an assay dependent concentration. Predicted molecular weight: 227 kDa. Smooth muscle; expressed in the umbilical artery, bladder, esophagus and trachea. 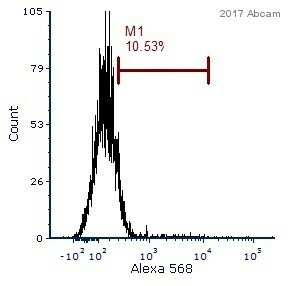 Note=A chromosomal aberration involving MYH11 is found in acute myeloid leukemia of M4EO subtype. Pericentric inversion inv(16)(p13;q22). The inversion produces a fusion protein consisting of the 165 N-terminal residues of CBF-beta (PEPB2) and the tail region of MYH11. Defects in MYH11 are the cause of aortic aneurysm familial thoracic type 4 (AAT4) [MIM:132900]; also known as familial thoracic aortic aneurysm and dissection (TAAD). Aneurysms and dissections of the aorta usually result from degenerative changes in the aortic wall. Thoracic aortic aneurysms and dissections are primarily associated with a characteristic histologic appearance known as 'medial necrosis' or 'Erdheim cystic medial necrosis' in which there is degeneration and fragmentation of elastic fibers, loss of smooth muscle cells, and an accumulation of basophilic ground substance. Patients with AAT4 show marked aortic stiffness. Pathological aortas show large areas of medial degeneration with very low smooth muscle cells content. The rodlike tail sequence is highly repetitive, showing cycles of a 28-residue repeat pattern composed of 4 heptapeptides, characteristic for alpha-helical coiled coils. Each myosin heavy chain can be split into 1 light meromyosin (LMM) and 1 heavy meromyosin (HMM). It can later be split further into 2 globular subfragments (S1) and 1 rod-shaped subfragment (S2). Melanosome. Identified by mass spectrometry in melanosome fractions from stage I to stage IV. Thick filaments of the myofibrils. 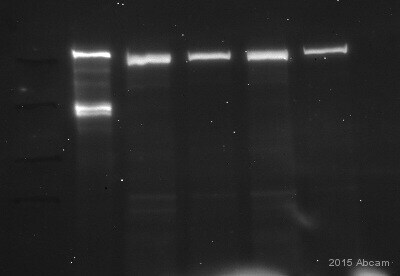 Immuhistochemical analysis of paraffin-embedded sections of uterus labelling smoth muscle myosin chain 11 with ab53219 at 1/500 dilution. 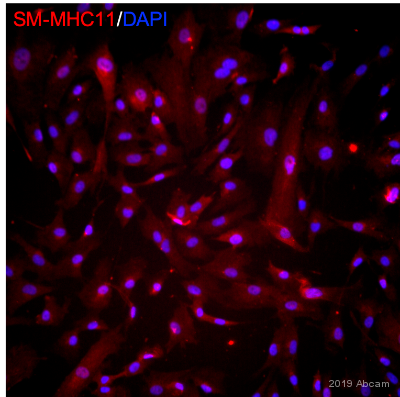 ab53219 staining smooth muscle Myosin heavy chain 11 in Pig aortic smooth muscle cells by ICC/IF (Immunocytochemistry/immunofluorescence). Cells were fixed with paraformaldehyde and permeabilized with 0.1% Triton X-100. Samples were incubated with primary antibody (1/50) for 1 hour at 25°C. Ab6717 (1/400) was used as the secondary antibody. Immunocytochemistry/ Immunofluorescence - Anti-smooth muscle Myosin heavy chain 11 antibody (ab53219)This image is courtesy of an anonymous abreview. ab53219 staining smooth muscle Myosin heavy chain 11 in Human smooth muscle cells by ICC/IF (Immunocytochemistry/immunofluorescence). Cells were fixed with paraformaldehyde and permeabilized and blocked in 1% serum, 0.1%triton, 0.1% BSA in PBS. Samples were incubated with primary antibody (1/100) for 16 hours at 4°C. 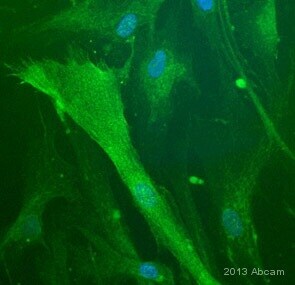 A Goat anti-rabbit IgG Alexa 488 (green) was used as the secondary antibody, and DAPI was used to stain cell nuclei (blue). Publishing research using ab53219? Please let us know so that we can cite the reference in this datasheet.